Leaf mold is what nature has been doing since there were trees. The leaves fall, and over time they break down into a nutritious layer on the forest floor. If you walk in the woods, you’re walking on decades of leaf mold. 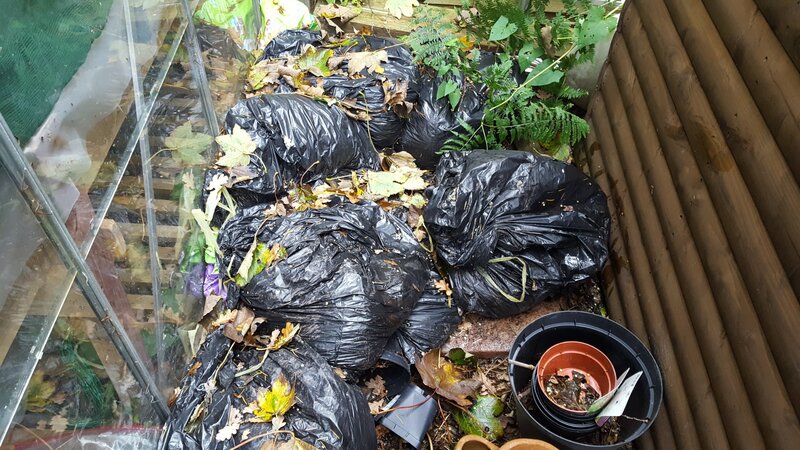 Leaf mold is often referred to as compost but they are not the same thing. 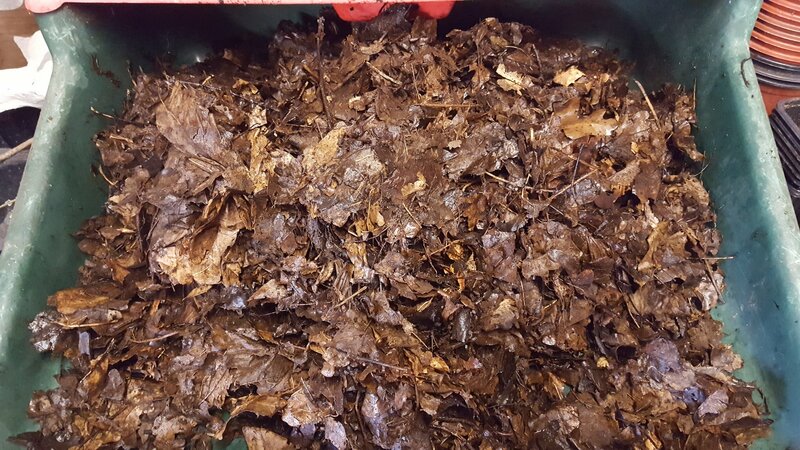 If you put leaves on your compost heap they will compost down with the grass and kitchen scraps etc and the resulting black gold is compost. This is a process of bacterial decay, helped by heat and worms. It’s relatively fast, taking a few months to get good useable garden compost. In contrast, leaf mold is the result of a much longer process of fungal decay. This is a cool (ie not hot) process and can take 2 to 3 years to generate a final product that can be used as an ingredient in seed sowing or potting mix. The making of leaf mold is almost child’s play. The easy way is to make a sort of cage from canes and wire mesh, about 3 feet square and deep is good, bigger if there’s room. Fill with leaves, wet down, top up with more leaves, wet again and cover with a tarp. Wait two years, possibly three, maybe turn it a few times. The really, really easy way is to stuff a black bin liner with leaves, wet them, top up and loosely tie the bag. Poke some holes in the bag with a garden fork then leave them somewhere out of the way for two or three years, giving the bags a shuggle every now and again. I chose the really, really easy way. I don’t have many overhanging trees so, much to my children’s amusement, I went to my local park equipped with a rake and bin bags. It was the work of but a few minutes to fill up a dozen bags with sycamore leaves. Here is last year’s batch, minding its own business between the shed and the greenhouse. It got to the point last year where passing a pile of leaves would cause me almost physical pain at the waste. This year I will get all the leaves! I might leave some for you. Pun very much intended. This is what mine looks like after about ten months. It’s fairly well broken down, but not yet the fine crumb that is the finished product. If two or three years seems like a long time to wait, there are options. After a year the partially decayed leaf matter can be used as a very good mulch, applied on the borders or veg beds in the spring. The worms love it and will take it down into the soil in double quick time. It’s good for soil structure and happy worms mean happy soil. The process can be made to go faster if the leaves are chopped up first, using a shredder or a lawn mower. I also read that oak, hornbeam and birch make excellent leaf mold and also faster than big thick leaves like sycamore or chestnut which take longer to break down. Regardless of the leaf type and method, the process requires moisture to work – an occasional squirt with a hose is adequate. It’s a slow process so the important thing is to make a batch every year, then after an initial wait for the first batch, you’ll have an annual supply. The fungal decay process reduces the volume of material to about a quarter of what went in at the start, so more is more in this case. The finished product can be used as seed compost, or as a component in a potting mix, along with garden compost and some sand. In either case it needs sieving first really. It’s quite autumnal out now, so I shall soon be off to the park again, looking for some good oak trees this time. I’ll be back soon with more propagating jazz. Previous Previous post: Do as I say, not as I do! Next Next post: Where’s Wally? Where I think leaf Mold scores over compost is no weed seeds! Possible sycamore seeds though! Although I think they’ll have sprouted and died in the bags. Looking forward for the end result. Really useful information. We have lots of oak trees here. My daughter has been raiding local parks for years. there must be oak trees in our local park, i shall hunt them out. i do actually have an oak tree overhanging the veg plot, but not in a way that generates rake-able volumes of leaves. thanks! I think you should submit your blogs to a publisher to see if they are interested in you writing a book or articles for the local newspaper. You obviously really enjoy doing it. We’re possibly over-booked on propagation but your Mum may have a point about the local newspapers. Won’t cost anything to ask if they’re interested. Local freebie papers/mags are always on the lookout for people who aren’t celebrities so who won’t ask an exorbitant fee. What? You don’t think I can command an exorbitant fee??!! Outrageous.